Airbus will introduce its new pivoting overhead stowage option for the A320 Family aircraft beginning in Q1 2016 with the delivery of the first of 45 brand new A321 aircraft for Delta Air Lines. In 2013, Delta placed an order for 30 new A321s and added a further 15 in 2014. The new pivoting bins from Airbus, which are also available for retrofit, take full advantage of the A320’s wide fuselage cross section to offer the most overhead stowage volume of any single-aisle airliner per passenger. Aesthetically, they embody a modern curved appearance which incorporates Airbus’ most up-to-date design branding – as exemplified in the cabin of the new A350 XWB airliner. 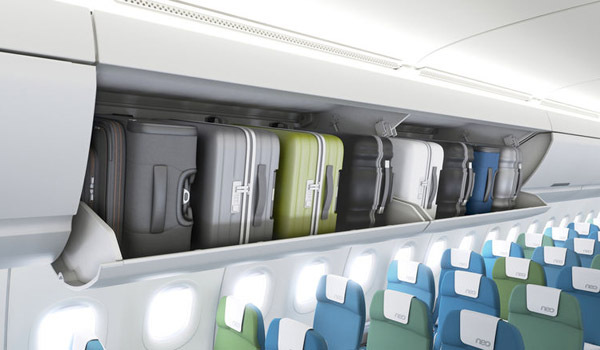 Addressing today’s passenger expectations for more carry-on baggage, not only do these new overhead bins offer 10 percent increased volume over current A320 bins, but the efficient A320 cross-section also allows increased capacity for up to 60 percent more luggage in practice. For example, each section now efficiently accommodates eight TP22-enhanced* roller bags. Alternatively, the same section can also hold four TP24s** (the largest type of carry-on roller bag). * TP22 ‘enhanced’ roller bags measure 22x 14.5 x 9 inches – i.e. half an inch higher than ‘FAA’ standard bags.